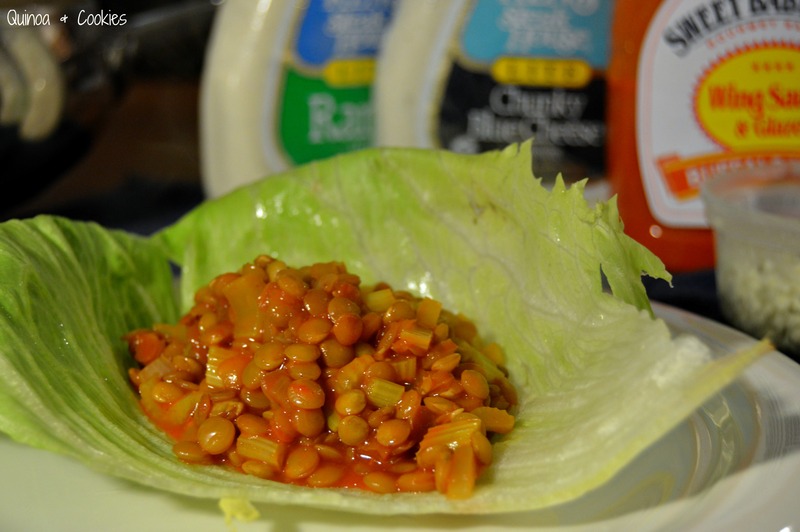 Lentils, celery, buffalo sauce…yeah, this is my kinda dinner! Recently, Brendan has been on a bit of a health kick. Instead of eating the donuts sitting around the faculty room at school, he’s trying to make a conscientious decision to make smarter food choices. One of the things he’s been big on is better carbs. Rather than going carb-free, he’s been wanting smarter, multipurpose carbs. You know, things like lentils, and beans, and quinoa instead of white rice and a side of fries. Believe me, it hasn’t taken much convincing to get me on board with this plan. I mean, seriously: I get to make all of these fun dishes that I love and he really wants them too? Okay!! Anyway, a few weeks ago my mom discovered a recipe for buffalo chicken lettuce wraps on Pinterest. You know, like they have at PF Changs, only with buffalo sauce instead of a Chinese flair. The recipe was insanely easy to throw together – rotisserie chicken for the win – and we all loved it. Instead of just making that again, though, I knew I wanted to put my own personal touches on it. Enter the lentils. As I said, we’ve been on a lentil kick lately. They are so affordable and versatile and healthy! 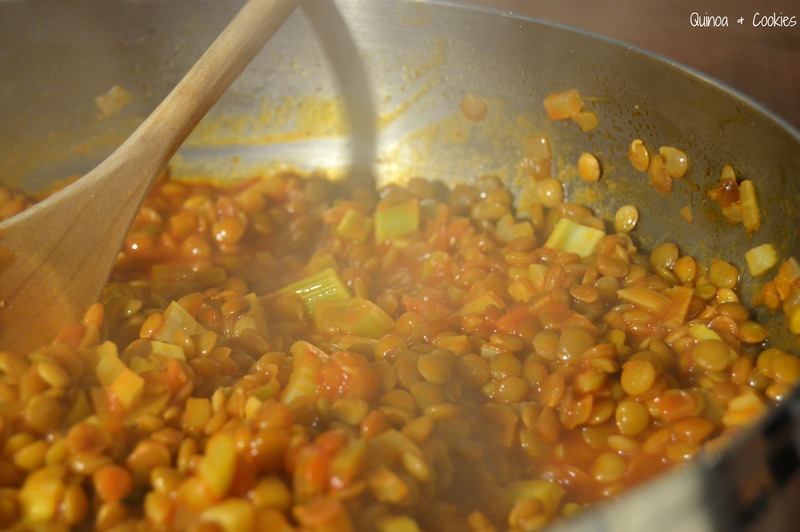 I’ve honestly been making a lentil of the week for the past month or so, and all of the dishes have been a success. This one may have been one of our favorites, though. With everything cooking in one pan, it’s a pregnant woman’s dream meal. Plus, the outcome was absolutely delicious. It had significant kick to it, but we mollified the heat by adding bleu cheese to our wraps. And the leftovers from this dinner held up beautifully! They can be eaten either heated back up or straight out of the fridge for a quick and convenient lunch. I’m not kidding when I say that this meal is one of those that feels super indulgent while actually being really good for you. I mean, it’s just like getting a plate of wings…only not. So if you want something healthier than that plate of wings, or buffalo chicken pasta bake, or cheesy gooey buffalo dip, this is the answer! Steamy lentils, straight from the stove! 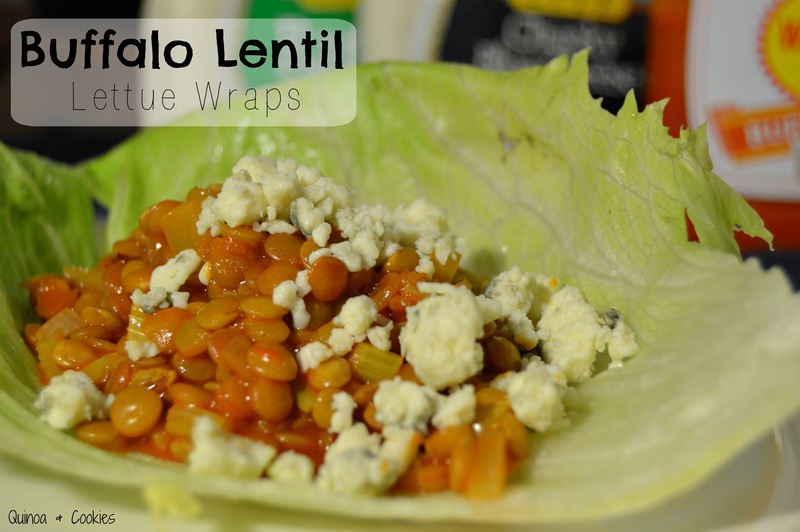 These wraps are delicious on their own, but can be kicked up with any number of additions! In a large pan over medium heat, sauté onion in olive oil until softened. Add garlic powder and cayenne pepper, and continue to sauté until fragrant. Stir in lentils and stock. Bring to a boil, then reduce to a simmer and partially cover. Simmer for 20 – 25 minutes, until most of the liquid has been absorbed. Stir in buffalo sauce and celery, and continue to simmer for about 10 minutes until most of the sauce has been absorbed and the lentils are tender. 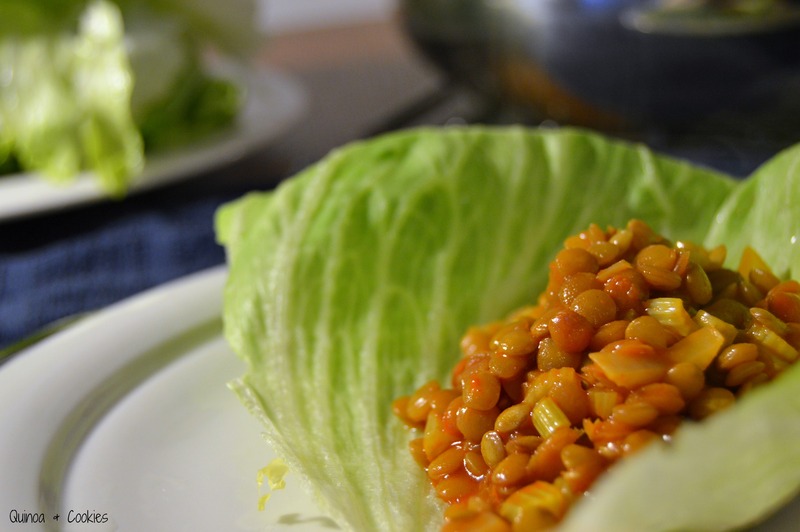 To assemble the wraps, put a spoonful of lentils in the middle of a lettuce leaf and top as desired. Fun idea! Looks tasty and easy to make! This would be a great way to get my fix that is so much healthier than standard wings. Thanks for linking up on Tuesday!